Overall, the modest price increases year-over-year for the non-hybrid 2013 7-series accurately reflect the added value BMW built in, but the ActiveHybrid 7’s pricing is pretty interesting. The first ActiveHybrid 7 was positioned similarly to the Lexus LS600h hybrid, with the electric assist intended to give the eight-cylinder sedan the power of a V-12 but with V-8 fuel economy. For 2013, BMW ditched the original system for the same setup used in the smaller 2012 ActiveHybrid 5, which promises to be more efficient. The BMW ActiveHybrid 7 have loaded with 6 cylinder 4 valve which produce max 320 hp at 5800 RPM and max torque 450 Nm. It achieve 0-100 Km/h in 5.7 sec .The top speed of this is 250 Km/h. The ActiveHybrid 7 uses the energy generated from deceleration with unparalleled efficiency. Touch the brake paddle, and the hybrid management system uses the pressure on the brake pedal to calculate the optimal interaction between the electric motor and the conventional braking system. The electric assembly then ensure the required braking effect, while also charging the high performance lithium-ion battery with up to 15,000 watts. An engine with a mind of it’s own. In future, you’ll be able to take your foot off the gas with a smile. Because the BMW Activehybrid 7 electric motor act as a full- fledged generator when costing and bracking. With the hybrid start stop function and 8-speed automatic transmission, the BMW ActiveHybrid 7 conserves energy every time you stop. As soon as the vehicle stops at a traffic light, the energy switches off automatically while the transmission remains in the desired position. Give the command to go , and the electric motor starts the engine and the connection to the gearbox and full power are restored. This reduce the fuel consumption and emission , especially in stop and –go traffic. Exclusive appearance with an electrifying character: the new Adaptive LED Headlights unite a striking form with dynamic function – new kidney grille slats and chrome accents on the front apron further enhance the distinctive impression, with the large air inlets reinforcing the muscular overall effect. The aptly named Air Curtains channel the airstream on the front apron and front wheels. As a consequence, the drag resistance – and hence fuel consumption and CO2 emissions as well – are effectively reduced. The silhouette reveals the classical proportions of a BMW sedan in its most luxurious expression – particularly in the long version. Indicator lamps in the exterior mirrors reliably display any changes in course. At the rear, discreet changes in the contours, repositioned reflectors as well as intricate chromium elements round off the impressively masterful overall picture presented by the BMW ActiveHybrid 7. Form and function for fewer emissions and more driving pleasure: resistance-optimised aerodynamic rims in Turbine styling guide the airflow optimally along the sides of the vehicle, thus reducing drag. The optional 19” aerodynamic rims and the Liquid Blue paint finish underline the progressive character of the vehicle, as do the ActiveHybrid 7 specific lettering on the rear, on the C pillars, in the interior and on the engine cover. Strength comes from the calm within. This is why travelling in one of the most dynamic luxury-class limousines is an extremely relaxing pleasure. Intelligent BMW ConnectedDrive innovations ensure that you never lose your calm even when times become hectic or situations unclear. 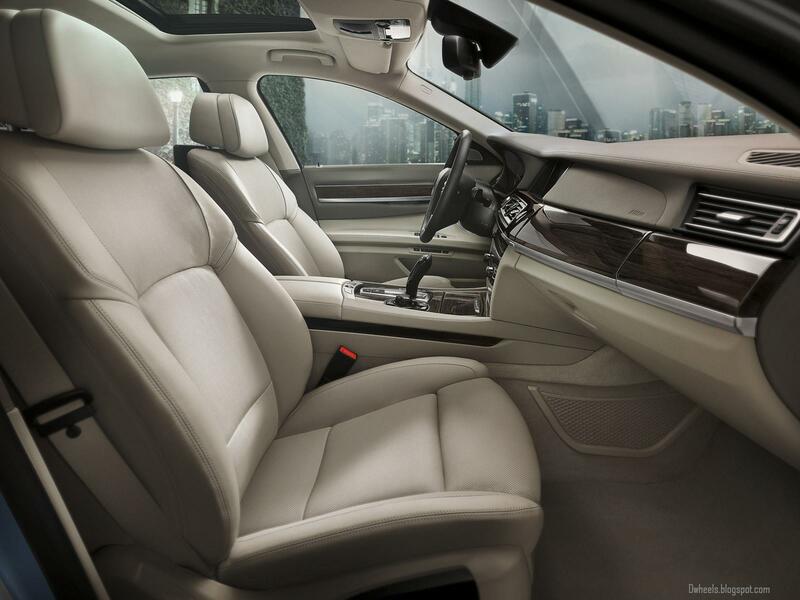 As soon as you leisurely take a comfortable seat in the BMW ActiveHybrid 7 and close the door behind you, an oasis of calm envelops you. All the frantic activity of city life and traffic noise stay outside – on the inside only the passengers and their comfort count. Soothing relaxation awaits the strained muscles of rear passengers in the optional comfort seats with massage function. Twelve air chambers massage the back muscles with wave-like motions from top to bottom, while six further chambers rotate from the shoulders to the lumbar vertebrae. During the journey, the standard-feature air suspension for the rear axle and the COMFORT+ driving mode geared towards the ultimate in well-being, particularly when combined with the optional Integral Active Steering, confidently minimise any disruptive physical influences. Especially when seated in the rear cabin, you can take a very relaxed attitude towards poor road surfaces and dynamic cornering. If space is the measure of all things, the long version continues to provide the ultimate comfort in terms of legroom. The Adaptive LED Headlights essentially shape the unmistakeable appearance of the BMW ActiveHybrid 7. The accent line with indicator function cuts into the top of characteristic light rings – thus decisively redefining the expression of the entire front section. 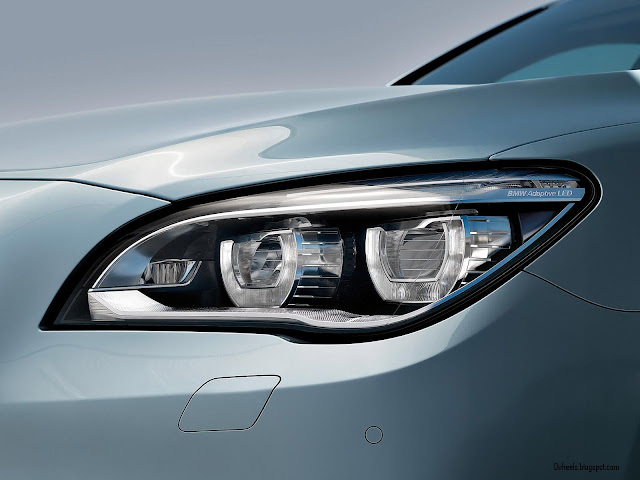 The distinctive form of the new BMW double-round headlights follows intelligent function: daytime running lights as well as dipped and high beam shine from the three-dimensional rings. The LED light illuminates the road with daylight intensity and rich contrast, while the cones of the Adaptive Headlights dynamically follow every turn in the road. When bends are taken slowly, the integrated cornering lights enclosed by an elegant chrome strip automatically light up the area at the side of the vehicle. The Dazzle-free high-beam assistance offers best possible visibility for the driver without obstructing others. A mechanism inside the headlights intelligently masks areas with the potential for dazzling other road users. The BMW ActiveHybrid 7 is an experience for all the senses: the interior inspires with a generous feeling of spaciousness, exclusive quality, precision down to the finest detail and first-class functionality. Typically BMW, the cockpit is systematically directed towards the driver, with instrument gauges and Control Display offering customised hybrid information. Ambient light immerses the vehicle interior in one of two atmospheric colours while the Bang & Olufsen high-end Surround Sound system fills the perfectly acoustically insulated compartment with a rich, crystal-clear tone. The new COMFORT+ driving mode in combination with the optional Integral Active Steering offers maximum comfort for all passengers: driving is superbly smooth, every corner and lane change takes place without rolling and becomes a single unique pleasant driving experience. In the rear in particular, individual climate comfort, optional comfort seats with massage function as well as the new rear-seat entertainment turn travelling into pure pleasure – and all of this with more legroom in the long version which has an extra 14 centimetres. When you set yourself maximum targets, you have to know where you stand. This is why the BMW ActiveHybrid 7 provides permanent information on current hybrid functions, charging status and fuel consumption – and gives valuable tips on how you can reach your next destination even more efficiently. New generation of Navigation system Professional. The latest generation of the Navigation system Professional takes the lead in every respect: it provides more and does so faster and more attractively, gives you an information lead – and helps you to reduce fuel consumption through special routes and individual tips for a highly efficient driving style. Eyes directed ahead and full concentration on what is important: the full-colour BMW Head-Up Display projects the current speed and navigation instructions conveniently onto the windscreen, directly into the driver’s field of vision.